We had a fun Saturday afternoon with J's Scout troop doing some backwoods cooking. 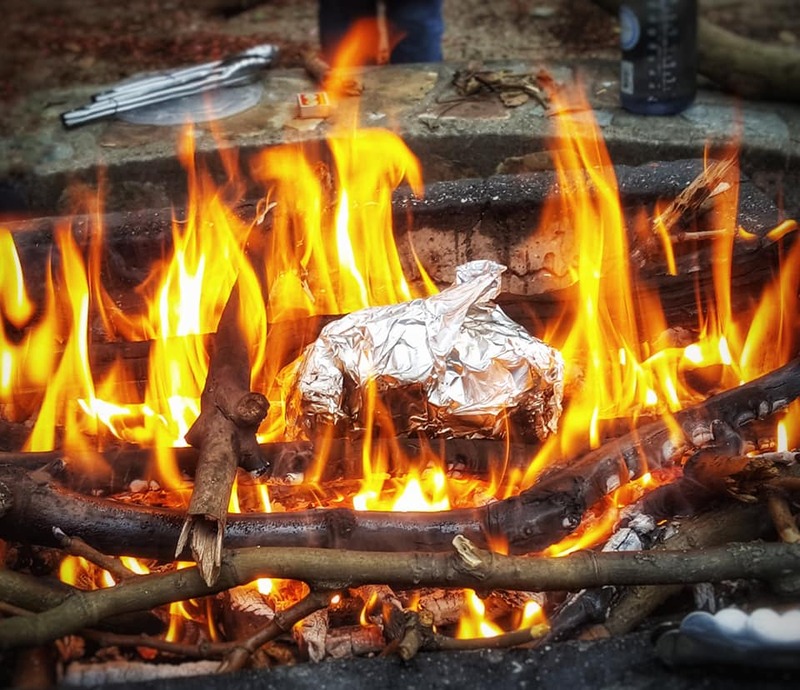 The scouts had to do everything themselves --gather kindling, light a fire, keep it going, make bread (from scratch), cook, putting out the fire, clean up. They roasted M&M-stuffed bananas, raisin bread, egg-stuffed potatoes... Some kids stuffed their potatoes with M&Ms instead and roasted those! This is then wrapped in foil and roasted. They first hollowed out the potatoes, cracked eggs into them, secured the "cap" back with toothpicks, wrap the potatoes in foil and roasted them. yum roasted potatoes! can't imagine them with m and ms though, how did they taste? What a great thing to do with kids! I know they all had an awesome time! Sounds fun, busy, and interesting. When young and a girl scout, we did the banana stuffed with a bit of chocolate, but I'll have to remember the banana one with M&M's for this summer with the grandkids. Not sure they've ever done that yet. Also, the potatoes will be one the hubby will want to do for a summer cookout. Thanks for sharing. Kids love that kind of stuff. I have never had potato stuffed with egg though. Sounds good! My favorite is always the tin foil dinner which is basically a glorified hamburger pattie with veggies.